A mission trip adult leader recently mentioned that my predecessor believed that every student (and their friends) should participate in a mission trip. As a result, for years, my church has filled a coach bus with 40-50 students and headed out for its summer mission trip. After all, bigger is better… Or so the thinking goes. The more people who participate in mission trips, the more people can be discipled. The more people who go, the more people you can serve. Bigger groups even mean cheaper per person prices on things like charter buses. I know these arguments and yet, as this leader talked, I found myself thinking, “I do not fundamentally agree with this." You see, while I, too, believe that every student should have the opportunity to go on a summer mission trip, I don’t believe that every student should go…. At least not all at once. As youth workers, we need to work hard to make sure that things like finances don’t prevent teens from going on mission trips. But our goal shouldn’t be to take every teen in our youth ministry on a single mission trip. That’s because when it comes to mission trips, bigger isn’t always better. Here are 4 reasons why. 1. It’s impossible to blend in with big groups. When you take a group of 40-50 people somewhere, you stand out. No matter how much you might try to blend in, you can’t. Your sheer size insures that you get noticed. While that might not seem like a big deal, failure to blend in makes it extraordinarily hard to cross cultures well (and remember, you often cross-cultures on domestic mission trips as well as international mission trips). No matter how much you educate and prepare your group, your group’s behavior (and loudness) will cause it to stand out. Sometimes, so will your dress. This makes it hard to learn and serve in a way that truly honors someone’s culture. 2. Big trips (by necessity) tend to be more about YOU than about those you seek to serve. Again, preparation can help you combat this. Yet, logistically, large teams require more. They require more housing, more food, more transportation, and more work sites. When you have a large group, you tend to dominate a space, even or especially if you’re crossing cultures. This can often make it appear as though you know all the “right” ways of doing things, which in turn can make it difficult to listen to and hear locals who might know way more about those you seek to serve than you do. 3. It’s hard to form a dynamic team with a large group. While advance team-building can help you overcome this, the truth is that 50 people seldom function as a cohesive team. In a large group, someone is always on the margins. This makes it more difficult for your group to serve well (and sometimes even effectively) together. 4. Big groups make it difficult to form meaningful relationships with those you seek to serve. Now, don’t get me wrong. In a group of 50, someone will form a meaningful relationship with someone you’re serving. More often than not, though, when your group is large, it’ll be adults (not teenagers) who form those relationship. Why? Because the group is too big for those relationships to happen naturally for most teens. For example, most local community members can’t host a group of 50 people in their home and share their story with them in a meaningful way. But I’ve been on trips where a group of eight students have been invited into someone’s home and have all left with a deeply meaningful (and sometimes even transformational) connection to that person. Ultimately, the success of a mission trip isn’t measured by how many people attend it. The success of a mission trip is measured by how teens grow in their faith during a mission trip. Mission trips are ultimately about discipleship. And arguably, short-term junior high and high school mission trips are specifically about the discipleship of those who attend them (not those you seek to serve). True discipleship happens best in small groups. There’s a reason Jesus chose 12 people to be his apostles and not 50. In my 16 years in youth ministry, I’ve led more than 20 mission trips, both domestic and international. Of all those trips, two of my favorites have been the smallest: A 10-student trip to Booneville, AK and an 8-student trip to Rwanda. Because those trips led to true transformation… Not just in SOME of the participants but in the team as a whole. Through those trips, teens were deeply discipled and as a result, long-term change happened in our team and later, in the communities we returned home to as teens continued serving, growing in their faith, and advocating for those they’d met on the trip long after it ended. 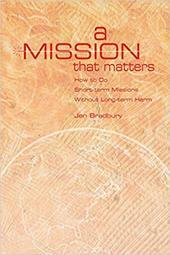 To learn more about how to do short-term mission trips without long-term harm, check out my book, A Mission That Matters.